PENALTY AUSTRALIA! McCaw pinged for leaving his feet. In Nuits Saint Georges in France and loving the live updates. Can't believe the awesome second half. Makes me proud. Wabblies can forget the World Cup with Chieka as coach. England will blow them off the park. $5k up in smoke ???????????????????????? following at work in far western desert Oz.. Strangely all the big mouth Okkers have on very quiet.. Go ABs go this feed it's helping me pat my out my colleagues! Wallabies kick for the corner but have spilled the lineout. Now the All Blacks are running the ball out from their own goal line. 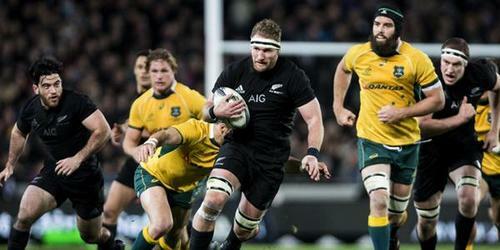 Great running rugby from the ALl Blacks. Ben Smith and Colin Slade linked up well before Conrad Smith was taken out early. 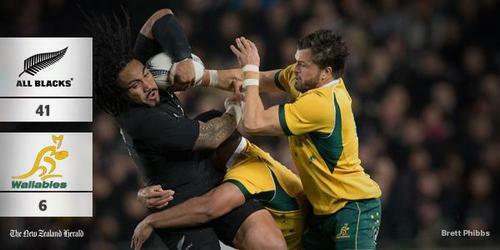 Its all about faith people.....last week the all blacks didnt go too well, but as expected they were going to respond. And what a response, clinical play typical of what they are truly capable of. Im not saying the game has been one because you can never expect what might happen, but definitly a much stronger response this half from the All Blacks. Go the Men in Black! Love it when the ABs do their 'three tries in 10 minutes' routine - hope to see it 'live' over here in England next month. ABs rule! No yellow card for the early tackle but the All Blacks do have a penalty. They kick for touch and win the lineout. Perched on the 22 now. Colin Slade??? Is he on for Carter? Slade came on for Milner-Skudder who went off after the Nonu try. Oh dear. It's all going wrong for the Wallabies. This time Nic White has thrown a forward pass on his own goal line. Smashing the All Blacks in Auckland and wrenching the Bledisloe Cup from their fingertips at their spiritual home too big an ask? Not according to former Wallaby Matthew Burke. He must have been smoking strong gunja. All Blacks scrum 5m out now. Boom. Dan Carter just got hammered in a tackle and the ball went squirming backward. But they have another scrum now, 5m out again this time right infront of the posts. I wish there was a "like" function on this blog .... so many comments i want to "like"
TRY ALL BLACKS! Nonu has his second. Carter took the ball flat from the scrum, attracted two defenders then threw a reverse pass to Nonu who powered to the line. Nonu really gets them going forward tonight! He has won every collision so fa. Carter slots the conversion and this second NZ half has just gone from good to great. TJ Perenara is on for Aaron Smith and Keven Mealamu is on for Dane Coles. 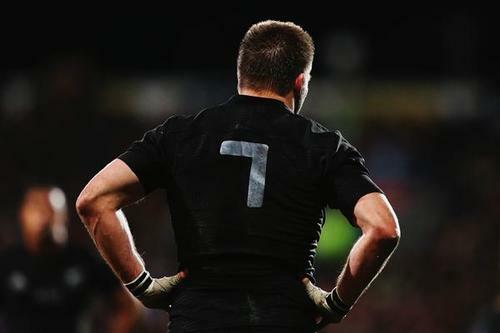 Richie McCaw has just come off to a thunderous reception. Scotty Stevenson said he has never heard applause like that for a player. Fekitoa is on for Conrad Smith. And Kaino has replaced McCaw. All Blacks are back in possession as they run the ball up just short of halfway. But the Wallabies turn it over. Can they get some consolation from this match? Penalty to Australia and Nic White kicks for the corner. Wallabies win the lineout and have another penalty but are playing advantage 5m out.